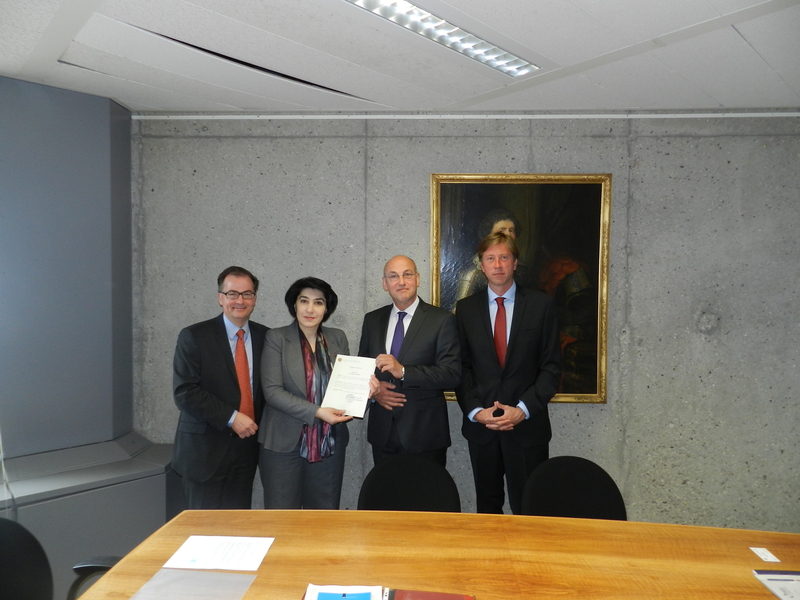 The Permanent Bureau is pleased to announce that on Tuesday 28 April 2015, Armenia deposited its instrument of acceptance of the Statute of the Hague Conference, and thus became the Conference's 79th Member. The Permanent Bureau was represented by the Secretary General, Mr Christophe Bernasconi, the Embassy of Armenia was represented by the Ambassador of Armenia, Her Excellency Ms Dziunik Aghajanian and the Minister-Counsellor, Mr Gevorg Petrossian, and the Ministry of Foreign Affairs of the Netherlands was represented by Mr Jules van Eijndhoven and Mr Mark Groen. The Permanent Bureau looks forward to Armenia's continued participation in the work of the Hague Conference and to welcoming Armenia at future meetings of the Organisation.